At Form8949.com, our aim is to help you minimize the time and expense of complying with the tax reporting requirements related to your stock trading activity. Do you use a Tax Professional? Use our app to retrieve your broker data and generate schedules of your capital gains and losses in PDF format. From the app, you can be sent an email to forward to your Tax Pro with information and links to your forms generated by the app. If your Tax Professional uses Drake Software, the above email includes a link to a downloadable spreadsheet file that can be used to import data directly into the Drake program. 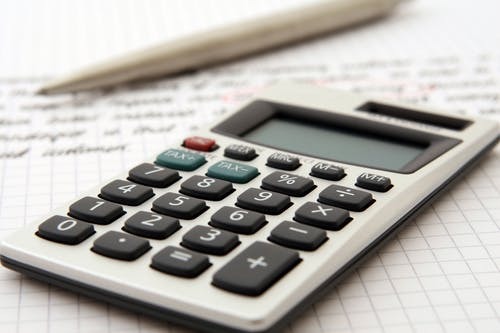 If your Tax Professional uses Intuit Lacerte, Intuit ProConnect, or Intuit ProSeries software, you can deliver the statements and data you generate at Form8949.com electronically to your tax preparer thru the "Intuit Link" and tax import features. Do you prepare your income tax return by hand? For many taxpayers with simple returns, money can be saved by preparing Form 1040, Schedule A, and Schedule B by hand. However, if you have more than a few brokerage transactions, it doesn't make sense to prepare Schedules D and Form 8949 by hand. For just $10, we can generate these schedules for you and save you the time and tedium of transcribing broker transaction data. You don't pay until after you review and approve our web application results. If you use one of over 30 brokers that do not participate in the TaxAct electronic import program, we can help. Use our app to retrieve and process your broker data. See TaxAct Import Steps for TaxAct Import details. If you have more than 2,000 transactions, use our site to generate Form 8949 Statements for attachment to your tax return. See TaxAct Statement Attachment Steps for more information. Do you use TurboTax and have more than 500 broker transactions? Do you use TurboTax Online and have more than 500 transactions ? or more than 1,000 transactions and use TurboTax Desktop Editions ? We can help. See our special solution for TurboTax users for more information. IRS Form 8949 only has room for 14 transactions per page. If you have many hundreds of transactions, this will result in a lot of pages. Our programs will generate both the official IRS Form 8949 and "Form 8949 Statements". These statements are acceptable to the IRS and hold 49 transactions per page, reducing the number of pages generated. There is no extra change for this conversion service and you can use whichever edition you prefer for your tax filing. You may download a sample IRS Form 8949 and a sample Form 8949 Statements to compare the two. We can convert your Excel spreadsheet (.xls) of realized gain and loss information to IRS Schedule D and Form 8949. See the spreadsheet requirements page for more information including templates. 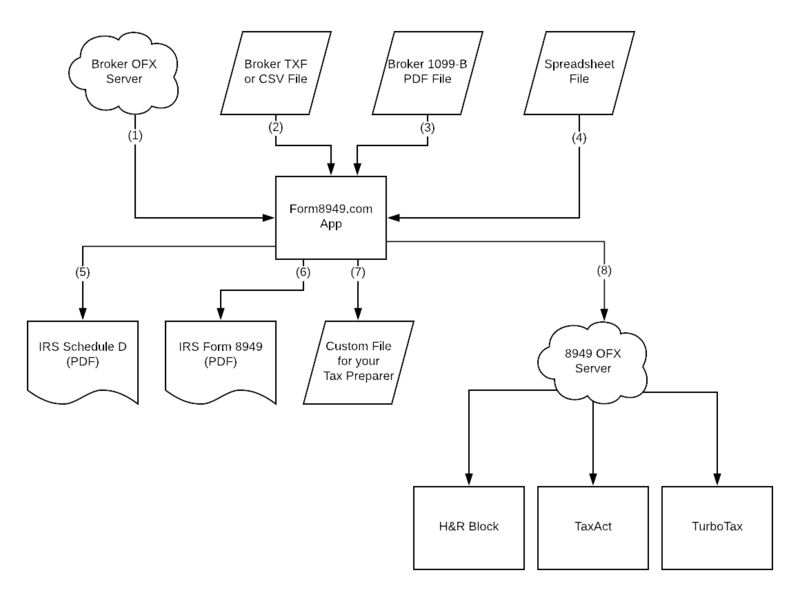 Our app (1) retrieves data from Broker OFX servers, (2) processes broker TXF or CSV files that you download from the broker web site, (3) processes broker 1099-B PDF files that you download from the broker web site, and (4) processes spreadsheet files that you create. We generate (5) Schedule D and (6) Forms 8949 in PDF format for attachment to your tax return. We also generate (7) files you can deliver to your tax preparer for use in professional tax preparation software. Your data can also be (8) imported directly into H&R Block, TurboTax, TaxAct, and other tax software. Processing of broker Forms 1099-B PDF files. Processing of broker trade data files. 2017 and prior year Forms 8949 can be generated in the 2018 app. There is no need to go to a separate app. Email us with requests for additional program features and improvements.